Welcome to the 2018 – 2019 school year! Welcome to Peace Academy! For more than 29 years, our independent, preschool through twelfth grade college preparatory school has been serving the families of Tulsa and beyond with a noble vision of building generations of academically excellent Muslim-American citizens. We seek to provide the tools to promote lifelong learning and an Islamic environment that inspires noble character and righteous leadership. We are blessed to have a diverse faculty from around the world who are not only knowledgeable about their respective disciplines, but who also model upright moral character, and who are passionate about working with students. Our small class sizes help students and teachers to develop strong relationships that support their learning. 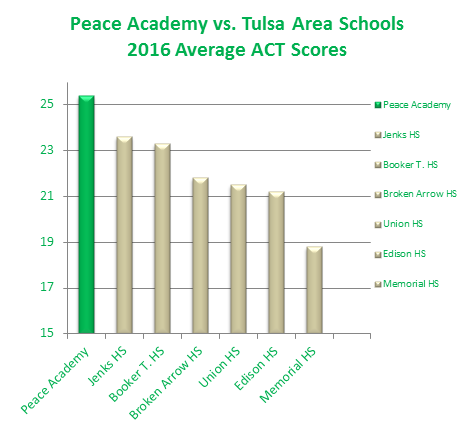 A Shared Leadership Model: Based on “best practices” of model schools both in Tulsa and across the nation, Peace Academy will be embracing a new “shared leadership” model in our school. The biggest change to be implemented beginning September 4, 2018, inshallah, will be the division of the administration of the school into two levels – Elementary (Pre-K-5th grade) and Middle/High (6th-12 grade). With this division, Peace Academy will now have two “interim” principals (an Elementary Principal and Middle/High Principal). Since it has been part of our five-year strategic plan to develop leadership amongst our own staff, we are now delighted to announce that our new Elementary School Interim Principal will be Mrs. Rania Hamdan, and our new Secondary School Interim Principal will be Mrs. Laura Agha. Both are veteran teachers in the school with decades of experience, and both possess exceptional leadership and organizational skills, masha’Allah. Both will continue to teach select subjects in their respective grades in the mornings, and will be available to meet with students and parents in the afternoons in their new Interim Principal roles. This week, each School Level Principal will be sending a welcome letter to their respective grade level parents inshallah. I have been working closely with both teachers for several years and I will continue to mentor and assist them with transition to their new leadership roles in the upcoming months inshallah. In addition to being the “Transition Lead,” I am excited to announce my new role at Peace Academy: Dean of Innovation and Technology. A Focus on Technology & Innovation: Current research and trends indicate that technology is no longer an optional perk of the classroom experience. Regardless of what career track a student wishes to pursue, 21st century skills necessitate that every student is proficient in utilizing technology as a strategic tool for learning. Peace Academy has become an official Google Apps for Education school, Alhamdolillah! In addition, each full-time faculty member of Peace Academy will soon be a Google Level 1 Certified Instructor, inshallah. I am passionate about building the capacity of our staff and students to leverage the use of technology as a tool for teaching and learning. In my new role as the Dean of Innovation & Technology, I will work with the Peace Technology Coaches (Mrs. Khamis, Ms. Gruse, Ms. El Sabbagh, Mrs. Naciri) to train teachers and students to strategically use technology as a student-centered tool for learning. Please be on the lookout for future emails from the Dean of Innovation and Technology (D.O.I.T.) which will highlight the objectives of this pioneering new initiative. College Counseling: Peace Academy is pleased to announce that Ms. El-Sabbagh will serve as Peace Academy’s new Academic and Career Counselor for the 2018-19 school year, in addition to serving as HS English Teacher. Having traversed the U.S. education system first hand on multiple levels (from primary school through Ph.D admissions), we are delighted to have Ms. El Sabbagh assume this new role, masha’Allah. Re-Accreditation: Alhamdulillah, this year Peace Academy is due for its 3rd Accreditation by AdvancEd. The process will involve gathering data and getting feedback about our school on every level – from facility, to teachers, to student experience. We invite you all to join us in our continuous improvement journey by participating in surveys, focus groups, and by volunteering your time and expertise in improvement committees. We will send out more information on what you as parents can do to support the school in our improvement journey. We hope you share our excitement about all the positive changes at Peace Academy, inshallah. The Board and Leadership team will hold a “Town Hall” meeting in two weeks to involve as many of our parents and stakeholders in our re-accreditation journey and to discuss the new changes in more detail, inshallah. We pray that Allah (swt) blesses our school and puts barakah in our new Shared Leadership Model and to make this another year of Excellence at Peace Academy inshallah, ameen. We look forward to working with you to build committed balanced Muslims, knowledgeable scholars, contributing citizens, and community builders (God-willing).